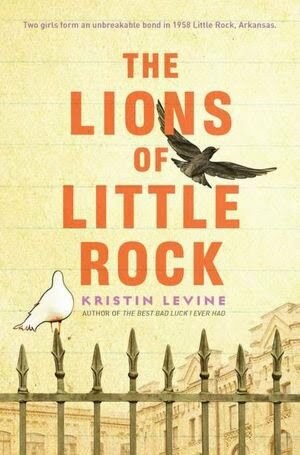 The Lions of Little Rock by Kristin Levine. G. P. Putman’s Sons. Grades 5 – 8. 304 pages. The year is 1958 and 12-year-old Marlee has a lot on her mind. Her older brother has left for college, her crush is cheating off of her in math, and her older sister — one of the few people that Marlee is able to talk to — has to live with their grandmother in order to go to school due to the fact that the high schools of Little Rock, Arkansas are closed to prevent integration. At night, Marlee listens to the lions of the Little Rock Zoo roar, and she wishes that she could find her own voice. When she meets Liz, a spunky and vociferous girl at school, the two form a strong friendship, and Liz helps Marlee gather the courage needed to speak up for herself. All seems to be going well until it’s discovered that Liz is a light-skinned African American who’s trying to pass in a white junior high school. Liz is forced to attend a different school, and the two girls try to keep their friendship alive even though there are threats all around them. This is an intriguing and well-written novel that focuses on a time period that’s largely neglected: The year after the Little Rock Nine, when the high schools of Little Rock closed to prevent further integration. With themes of racism, change, growing up, and finding one’s voice, this is a perfect book for a book talk during Black History Month or to recommend to a teacher who’s doing a lesson plan on this time period. Marlee and Liz are strong and likable characters, and I think many junior high students will relate to Marlee’s quest of overcoming her shyness and finding her voice.